The picture below is my morning routine. I do this every single day. I made a conscious decision to improve my life and this is how I started. A morning routine will jump-start your day and help you be more successful and social. I’m going to share why this is important and guide you through what I do every morning. The average person would rather sleep in for an extra hour rather than get up and do something that’s really going to benefit them. They don’t think that one hour can change their entire day. That really got me thinking. What do I do now that is going to change my entire future? I honestly believe it starts with my morning routine. Now I’ve done my research and there are lots of ways to plan your morning routine. It could be as simple as waking up 30 minutes earlier to listen to a podcast or read a book. Some people get really nitty-gritty and plan out exactly what they’re going to eat every single day and make sure that it’s all done by a certain time. The important thing is that your morning routine helps you. Personally, my morning routine is full of things that I want to get better at or work on. My dog Ralph is a rescue and when he first came home with me wouldn’t even let me touch him. So taking him out in the morning, running around, and feeding him is part of him and I bonding. I started doing this about six months ago. Even though I didn’t see and immediate differences I saw gradual changes. And just about a month ago Ralph started getting on the bed with me and sleeping by my side at night. This is a dog who wouldn’t sleep in the same room as me unless I made him. It didn’t happen immediately but I was diligent in taking care of him every single morning and spending that time with him. This next part of my routine is fairly new. Actually, brand new if you want me to be honest. This year has taught me to value my relationships with my close friends and family because they are the ones who have supported me through my hardest times. Knowing that it can be hard to keep in touch with everyone I added this to my morning routine. Every day I wake up and I ask myself who are two or three people you haven’t connected with in a while. Once I think of them I send them a cute message (usually with a Giff) telling them that I’m thinking about them. This not only starts my day off with a smile on my face it puts one on theirs too. My next task is to check my email. Some people discourage this from their morning routine because it means taking care of others rather than yourself. For me it’s important. I need to make sure that my business is getting handled early in the morning so I don’t worry about it the rest the day. Plus if there is something really important waiting in my inbox I can reply to it immediately. Right after I check my schedule. Everyone has their weaknesses and unfortunately mine is I’m not very organized. That means until I can hire an assistant I have to be my own. The reason I put this in my morning routine is that I don’t want to mess up my day by missing an appointment or forgetting about a story I need to write. I have experienced this before and it was not a good day. Checking my schedule refreshes my memory and gives me an outline of what needs to get done that day. Now I know you’re wondering what I ams are (I plan on making a blog post about this to go more in depth about what they really are) but they are the declarations I make in the mirror every morning. They keep me grounded in who I am and who I want to be. I encourage everyone to include some type of mantra in their morning routines. Like I said I’m not very organized and unfortunately this spills into my cleanliness. This isn’t to say I am a complete and total slob but I think we can all relate to the chair pile of clothes in the corner of our room. So in order to work on being more orderly, I set aside time to clean up just a little bit every day. I don’t deep clean or scrub my toilet every morning but I do make sure that my clothes are picked up and my car has no trash in it. That way when I am driving all day I’m not worried about how dirty my car is and then when I come home I don’t have to stress over having a dirty room. On my way out the door, I make sure to take my vitamins. This is something that might not make a huge difference in my energy levels during the day but I know it will benefit me over time. I want to live a healthy life. That means eating right and taking my vitamins every morning. The last thing I do is work out. This has several benefits including keeping me healthy and looking good. Both of these are very important to me because when I look in the mirror it helps me stay positive about who I am and who I am becoming. On my list of experiences that I want to have in my lifetime being really fit is one of them. This pushes me towards that. I won’t lie though, I only work out three days a week because I am in college. Once I finish though I want to move up to five days a week. Now that you know what my morning routine is and why I do it now you can make your own! What do you want to be better at or practice more in your life? Make sure there is a motivation behind each task on your morning routine list. This will help you want to wake up each morning. You also don’t have to have as many tasks as I do on my list or you could even have more! ( I would start off reasonable and build your list for best results.) Your list might not be the same as mine so I have included a list of things below that might be better suited for your own routine! 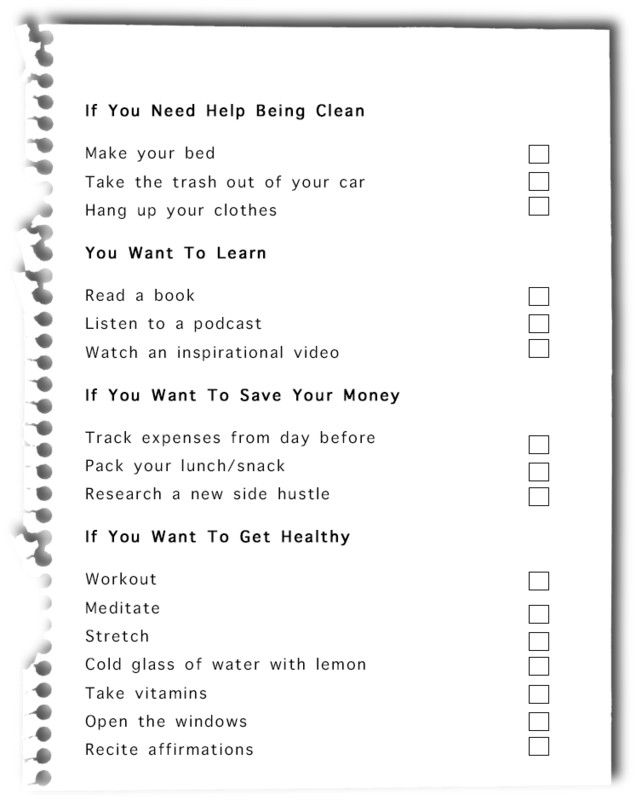 Print it out and check off your own morning routine tasks! UPDATE: I found this really great and hilarious article by Amelia Diamond (guess jewels stick together, right? haha) and you should totally go read it!